Worshiped and invoked in both male and female forms, Avalokiteśvara is considered a potent saviour in times of life-threatening dangers, who watches over all beings and heeds their cries of suffering and distress. He responds directly to the pleas of those in great need, while also serving in symbolic manner as the embodiment of the principle of compassion, a fundamental aspect of the Buddhist way of life. In addition to his numerous pan-Asian roles, Avalokiteśvara has played a significant role in distinctive local traditions throughout Buddhist Asia. The celebrated 7th century Chinese monk-scholar Xuanzang (c. 602–664) upheld this view, translating the Bodhisattva’s name as Guanzizai (“gazing lord”). This led to the well-known Chinese translation Guan Yin (“he who has perceived sound”). a saviour who hears all cries of suffering and responds with potent aid. Avalokiteśvara has numerous epithets. The most common are Padmapāṇi (“lotus bearer”) and Lokeśvara (“lord of the world”), by which he is best known in Southeast Asia. Many epithets related to his specific saving functions are connected to His many iconographic forms. It generally is agreed that the cult to Avalokiteśvara arose in the north-western borderlands of India. For example, some suggested Iranian antecedents based on Avalokiteśvara’s name and functions. for example, some suggested that Avalokiteśvara is the personification of the compassionate gaze of Śākyamuni. Such views are far distant from the notable intensity of belief in the compassionate lifesaving powers of this deity, as expressed among Buddhist Asians from all levels of society. Mahāyāna scriptural traditions simply hold that Avalokiteśvara is one among many beings having human history whose dedication and spiritual development has led to successful fruition as a Bodhisattva. 3) the so-called Amitāyurdhyāna-Sūtra (Contemplation on Amitāyus scripture). while the Sukhāvatī-vyūha and the Amitāyurdhyāna-Sūtra reveal his spiritual kinship to Amitābha Buddha and outline his functions in this context. The chapter includes discussion of the Bodhisattva’s name, the dangers that he can dispel, and the myriad forms in which he may appear to aid devotees. Śākyamuni Buddha explains in the scripture that this name arises from the Bodhisattva’s pledge to heed the call of any suffering being who cries out his name and to appear before him in rescue. The Bodhisattva also assists those ensnared by the traditional 3 poisons of Buddhism: lust, anger, and delusion. 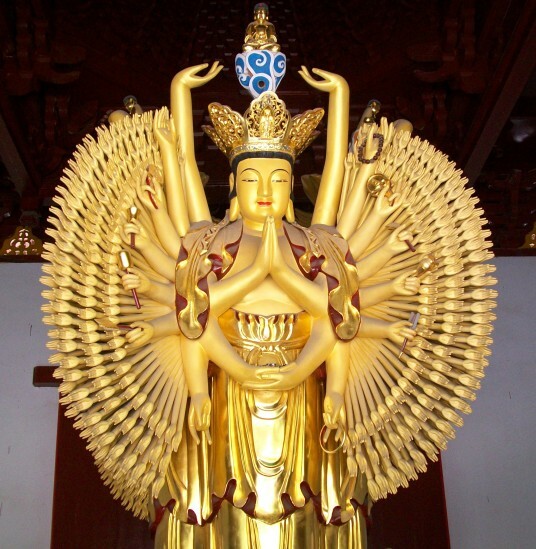 Avalokiteśvara also grants children - both male and female - in response to the pleas of barren women. According to the Lotus Sūtra, Avalokiteśvara is a master of skilful means (Upāya) who is adept at manifesting himself in any suitable form (33 are listed) to convey the deliverance of any being. Both are principal assistants to the Buddha Amitābha, lord of the Western Paradise, a glorious realm free of suffering where diligent questers for Enlightenment may be reborn after earthly existence. Among his various functions, Avalokiteśvara guides devotees from earthly deathbed to rebirth in the spirit land. He acts as emissary for the Buddha throughout the various realms of the universe, and he is described as the eventual heir to the throne of this realm. Successful accomplishment of this practice leads not only to future rebirth in the Western Paradise, but also to continuous invocation of the principal lords of that land, with the accompanying protection and inspiration they afford. these rays reach into the various realms of existence and send forth manifested Buddhas and Bodhisattvas, who accomplish his works of compassion. Innumerable rays of soft light extend from his hands, illumining all things, and he is seen to be assisting all beings with these hands. Avalokiteśvara is believed to dwell on a certain mountain from which he attentively hears the rising cries of suffering beings and extends his mystic aid. A version of the Avataṁsaka Sūtra (Flower garland scripture) identifies this site as Potalaka Mountain, a name that became well known throughout Buddhist Asia. This mountain has been identified with a number of actual geographical sites in Asia. The 7th century monk-traveller Xuanzang noted that Potalaka could be found on the Malaya coast, although few who sought the Bodhisattva had been successful in their quest. From at least the 10th century it was identified as an island off the coast of the southern China seaport of Ningbo, which was named Putuo Shān (Potalaka Mountain) and remains an important pilgrimage centre to the present day. at the Nachi Falls within the Kumano Shrine complex near the ocean on the Kii Peninsula, in the mountains at Nikko, and at the Kasuga Shrine in Nara. Thus, the mountain palace was physically made manifest as the residence of the Tibetan ruler, believed to be the physical embodiment of the Bodhisattva. - the multiplicity of features expressing the Bodhisattva’s extraordinary abilities to seek out and respond to the distress of all beings. Often, especially from the 9th century onward, this form wears a crown or headpiece in which the image of his spiritual father Amitābha Buddha is depicted. With special emphasis on the motherly compassion of the Bodhisattva, this form most often is depicted as a female seated in meditation or holding a lotus blossom. - or in another healing form seated upon a roaring lion. Other important forms include Amoghapāśa (“unfailing rope”), holding out a lasso to assist all beings, or the fiercely protective Hayagrīva, horse-headed with dark flames emanating from his body. Avalokiteśvara is also shown paired with Mahāsthāmaprāpta in attendance on Amitābha, performing various functions in the Western Paradise, and he is seen as one among 8 or more Bodhisattvas in numerous types of assembly scenes throughout Mahāyāna art. This vast array of iconographic forms, only touched upon here, provides a sense of Avalokiteśvara’s preeminent popularity throughout the Asian Buddhist populace. - as an all-seeing lord, encompassing views of the 4 cardinal and the 4 intermediate directions, as well as the nadir, centre, and zenith. In East Asia, this form was first associated with special confession and repentance rites undertaken by lay and monastic practitioners. including pledges to do such things as relieve beings of illness, misfortune, suffering, and worries, free them of unwholesome intentions, and turn their thoughts toward that which is wholesome. for those capable of following the Mahāyāna path. The development of this Bodhisattvas cult is closely related to his function as extender of life and protector from the hardships and dangers of the world, who, as the Lotus Sūtra puts it, “confers the gift of fearlessness” in the midst of terror and trouble. by this time, according to Xuanzang, images of the Bodhisattva flanked the “diamond seat” of Śākyamuni Buddha’s enlightenment at Bodh Gaya, one of the most sacred sites in the Buddhist world. In all the coastal areas of Mahāyāna Buddhist countries, Avalokiteśvara has been especially worshiped and invoked for his lifesaving protection of seafarers. This ability, mentioned in the Lotus Sūtra, is attested to in numerous travel diaries and miracle tales from the 4th century to the present. As noted above, in East Asia Avalokiteśvara has been the most popular of all Buddhist deities, most especially by virtue of the prominence accorded him in the Lotus Sūtra traditions. The Lotus Sūtra traditions of the 33 types of manifestations of the Bodhisattva led in Japan to several very important pilgrimage circuits devoted to Kannon (Avalokiteśvara), each having 33 stations dedicated to the Bodhisattva. - and the recitation of his 6-syllable Sanskrit mantra, “Oṁ Maṇi Padme Hung,” has been a widespread practice among Tibetans. Tibetan tales hold that Avalokiteśvara was the progenitor of the Tibetan people, and they believe that the founder of the first Tibetan dynasty, Songtsen Gampo (569–649), was an incarnation of Avalokiteśvara. Similarly, especially since the 17th century, the Dalai Lamas, successive temporal rulers and spiritual leaders of Tibet, have been believed to be human incarnations of Avalokiteśvara.